Boulder, Colorado. 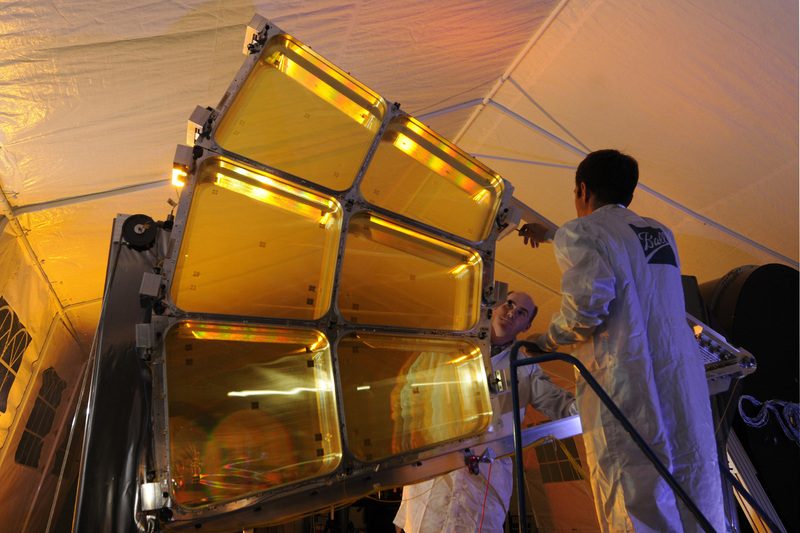 May 20, 2014 – Ball Aerospace & Technologies Corp. has completed the final phase of its MOIRE telescope program for the Defense Advanced Research Projects Agency (DARPA). The telescope’s primary mirror composite back structure and the structure deployment hinges successfully underwent environmental tests to simulate the temperature range and vacuum of a space environment. Image quality from space is dependent on a stable platform. The composite back structure developed by ATK Space Components provides a lightweight option with the required stability needed for persistent imaging from geostationary orbit. Ball Aerospace designed and built the deployment hinges that would be used to unfold the telescope primary in space. Testing the hinges in a relevant environment helps retire risk and proves the required stability characteristics of the primary. The DARPA MOIRE program is demonstrating the ability to decrease mass and costs of large imaging systems using lightweight diffractive membrane optics. Since the contract award in 2010, Ball Aerospace has been incrementally maturing the manufacturability required for large collection area telescopes (up to 20 meters). The subassemblies used in the most recent test are needed to hold the membrane optics tight and flat, and provide the necessary image quality of the system. Environmental testing of the components is the final phase of DAPRA funding for the MOIRE program.